Ireland's seabed area is a resource of major significance to the nation's future. INFOMAR/INSS, managed jointly by the Geological Survey of Ireland (GSI) and the Marine Institute in co-operation with other strategic partners, is a first attempt to truly understand this resource. 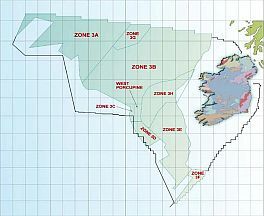 INFOMAR/INSS encompasses an area that is approximately ten times the size of Ireland's land area and represents one of the largest seabed mapping projects undertaken anywhere in the world. Maps that result from the survey are a pre-requisite for the policy evolution, management and sustainable development of Ireland's marine resources. 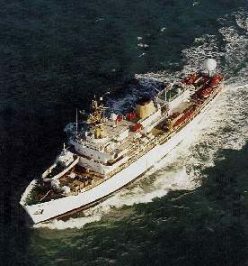 INFOMAR/INSS is primarily about acquiring baseline information to promote and encourage research in marine science. Most of Ireland's seabed is unmapped and consequently represents a large untapped resource of potential benefit to many different sectors. In authorising this survey the government recognised that Ireland must maximise the commercial opportunities presented by its marine resources and plan measures to protect the marine environment in the most effective manner possible. INFOMAR/INSS also represents an opportunity to build up national marine expertise and to spread this expertise across government agencies, third level institutions and a strengthened private sector. Survey Components - How is the survey carried out? INFOMAR/INSS is primarily a multibeam sonar survey of an area of 525,000 sq. km in size. 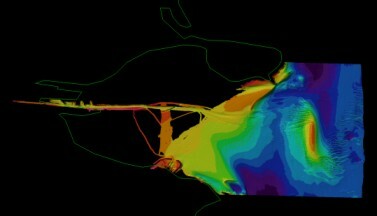 This acoustic technique is providing detailed bathymetry (water depth) data and knowledge of the nature of the seabed and its overlying sediment. Magnetic and gravity techniques are helping to evaluate the nature and structure of the deeper geology. Ancillary data is being collected on an opportunity basis and secondary projects can be initiated researching a wide range of marine topics (for further information see Ancillary Projects). Where is the survey taking place? The other primary area of work is the addition of value to the data via our extensive data-processing programme in-house in GSI. Each survey vessel has at least one GSI representative who acts in a Quality Control and Co-ordination role, and ensures that GSI objectives are met. The Captain of the vessel naturally is in charge of all vessel activities with a Party Chief as his deputy. 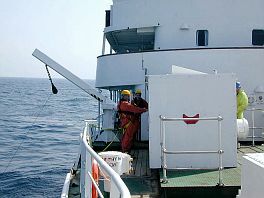 All personnel working on the vessels must have up to date and valid Medical and Survival/Safety Training Certificates (this includes ancillary scientists). 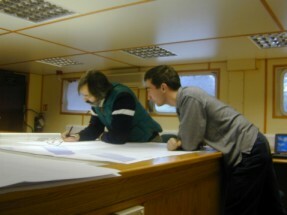 In the 2001 Annual Seabed Survey Seminar a GSI rep recounted his experiences giving an in-depth perspective of the role. What information technology underpins the survey? Much consideration has been placed on IT requirements since the survey is one which will originate vast amounts of data which will require storage, verification, technical analysis and manipulation into customer-friendly usage formats. Thus, the survey is underpinned by a 6-terabyte-server architecture that gives GSI the functionality to deal with different datasets. These are projected to grow exponentially in line with 2-3 ships gathering data at a typically 150-day field season (24hr day) each year for 5 years. This overall I.T. architecture will ensure the provision of high quality interpreted data to customers. For a review of previous years' activities click here.